Google rebrands yet another service. Paying with our phones may be easier than ever, but understanding which service to use, and when, isn’t. There’s Android Pay for checkout lines, Google Wallet for sending money to your friends, and Chrome’s autofill feature for online purchases. Now, Google is streamlining all of its payment methods and apps into a single service called, you guessed it, Google Pay. Here’s where it gets a little confusing. Google says Google Pay is available now “on Airbnb, Dice, Fandango, HungryHouse, Instacart, and other apps and websites you love.” Does that mean it’s rolling out to more websites? Do companies need to do anything on their end to support the new service? Is there even a new service to support? We'll get answers to those questions soon enough, but most importantly, it seems that users don’t need to sign up for a new service. While the Android Pay branding will switch over to Google Pay and the Google Wallet app will likely get a redesign and a new icon (or perhaps it will become integrated into a single Google Pay app), all of your saved credit card and banking accounts should seamlessly make the move. Basically, the same way you pay for things now will continue, except it’ll all be called Google Pay. Google says that the merging of Android Pay and Google Wallet into a single brand is “just the first step” in its new payment overhaul. So stay tuned. 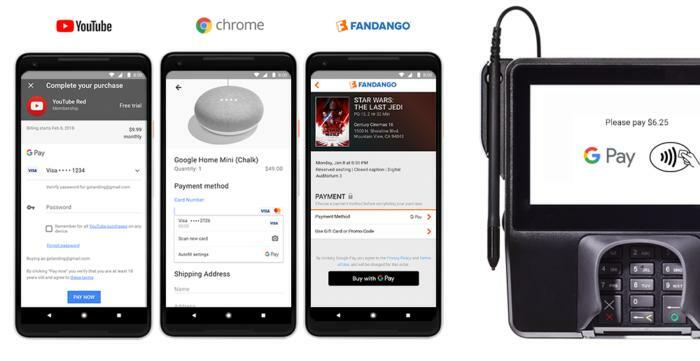 The impact on you at home: Google Pay may be replacing Android Pay on our phones to streamline the experience, but it doesn’t simplify the Android digital payments landscape in the slightest. There’s Samsung Pay, Walmart Pay, and Fitbit Pay just to name a few, and of course PayPal and Venmo. Some use fingerprint authentication, some work on our phones out of the box, other need apps and passwords. We’re not betting that Google is going to be able to streamline all digital payments with Google Pay, but it sure would be nice if Android had a single method for buying stuff.